Trust your most important memories with the GX-20 digital camera. It has an incredible 14.6 MP that produces sharp images and super rich colors. And the built-in Optimal Image Sensor gives you clear, steady pictures every time. Worried about rain or other less-than-perfect weather conditions? The GX-20 is also water resistant and comes with a special anti-dust coating. 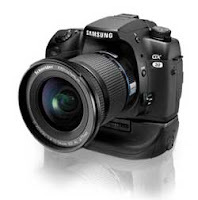 Snap stunning, high-quality photos easily, with the SAMSUNG GX-20 digital camera. With 14.6 megapixels in an APS-C size (23.4x15.5 mm), the GX-20 offers the greatest resolution in its class. Plus, sturdy 5.0㎛-size pixels - the smallest in their class-ensure the most vibrant images around. Taking photos is easier with the PentaPrism viewfinder. Its high magnification (0.95x) provides a clearer, wider view (95%) for optimum shooting. While most existing white-balancing functions use only standard values according to the situation, the GX-20 provides delicate, 100K step color temperature adjustments which give a more accurate white-balance control and more natural expressions. With an OIS Image Sensor and Stablization, you’ll be able to take more beautiful pictures. It eliminates any blur caused by unsteady hands and delivers crisp, clear images every time, even when you’re using a lens without an anti-shake feature. GX-20 utilizes a cutting-edge semiconductor processor and high-speed DDR2 memory to produce fast, high-quality imaging. The DSP enables more natural definition, a wide range of gradation, continuous shooting, and a prompt response to dynamic subjects. The GX-20 features a new 2.7" high-resolution LCD monitor that provides an ultra-wide viewing angle covering all directions. The 230,000-pixel high-resolution LCD guarantees a clear image preview as well as convenience when using the menu.